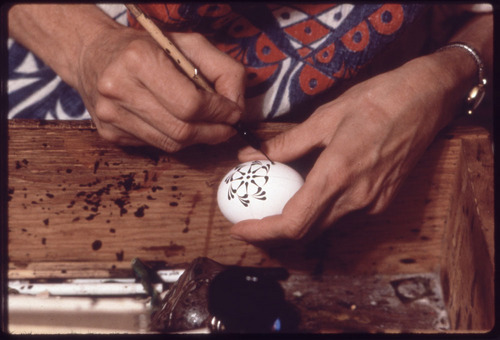 A view of the hands of artist Kepka Belton, of Ellsworth, Kansas, as she demonstrates Czech egg decorating. Belton has become known all over the country as "the egg lady." People write to her from every state, wanting recipes, eggs, designs, and information about their Czech heritage. She teaches egg painting and traditional Czech design in the local schools and has taught young artists in the Kansas Folk Apprenticeship Program. Her work has been exhibited throughout the Midwest and at the Festival of American Folklife at the Smithsonian Institution in Washington, D.C.